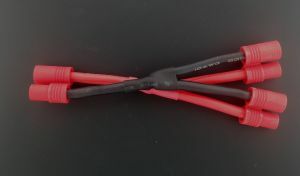 OSE Parallel Harness with 10 gauge wire for use with ose-qs6p bullet connectors. Using this will allow use of two batteries to double the system MAH but the voltage will be the same. Made with 6mm bullet connectors with red nylon housing. The included red nylon housing helps stop short circuits. What makes the OSE gold bullet connectors different than the other lesser expensive connectors on the market? We order our connectors with a gold plating that is much thicker than our overseas competitors. This increases the cost, but makes the gold plating last longer while also reducing resistance. Because runtime is doubled, its important to monitor heat buildup in the motor, esc and batteries. You must use two battery packs of the same exact specifications, age and quality. Failure to due so could cause a fire.